When it comes to nail polish the most important thing to me is long wearing, and chip resistant. I find myself gravitating towards Essie, OPI, Chanel, China Glaze, Revlon, Wet n wild, Sally Hansen the list could go on. I normally don't just buy one specific brand, just depends on what I'm looking for. Essie, and OPI are around the same price $6-10 at some places and I thought that was a lot but Chanel's are around $25, Sally Hansens, and wet n wild are anywhere from $1-5. I still haven't gotten my hands on any Julip, or Butter polishes although, I will be keeping my eye out for a few of those that are on my wishlist. Nail polish has always been something I've loved, but the last few months I've been really obsessed. Its kind of sickening, as my collection grows I tend to find myself buying so many of the same colors. (pinks) As I was browsing my collection I noticed most of my polishes are Essie and OPI. I mainly love these two brands because most of the time, their formula's are pretty average some are even great, most are highly pigmented and the most important the lasting power is a lot better then most with an occasional flop as any nail polish, but their always coming out with something different. Although the colors might be similar to many other older colors, or other brands they still have such a wide variety for just about anyone. 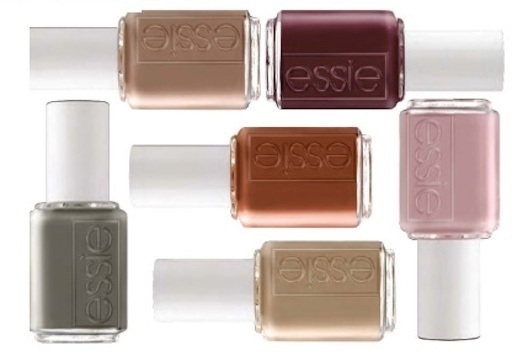 I've been eyeing the Essie Fall collection for the past two weeks dropping in every grocery store, Target, RiteAide anywhere that sells Essie to see if they have any of the new colors. Well for starters the only place I've spotted some (Walmart) they had two colors left with very few. Sadly the color that I've been eyeing wasn't their but I was fortunate to get the deep burgundy color carry on. 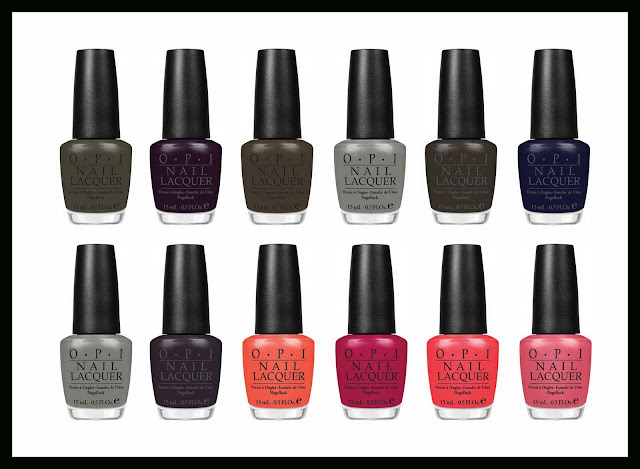 OPI has also came out with a newer collection for the fall, as well as a Halloween collection, but those don't seem to rock my boat. I really haven't heard to much buzz on these as I have the essie but we still have time I mean we still have 3 weeks of summer for Christ's sake. In this collection the only one that I've purchased so far was My address is Hollywood its a gorgeous pink coral. Last but not least I was super excited for the Chanel Collection to debut mainly because of Peridot. When I first seen this color I immediately had to get it. To be honest I have probably 5 greens in my collection and never worn any. This time I'm venturing out of my pinks, nudes, and more pinks. Its time to take a step out of my comfort zone and this is wear it all began. The names are just to cute! That's my favorite part of the whole collection. 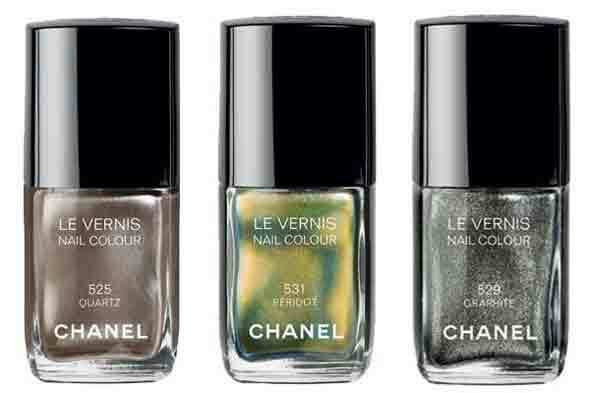 Although, these three colors are not all of Chanel's Fall collection. These three are what stood out to me the most. Although two of which you could find many dupes of. Peridot is getting the most buzz and is instantly selling out everywhere so I couldn't resist on not getting my hands on that one. As you can see metallic's, and glitters are definitely in for the fall. Grey's, burgundy's, nudes, and oranges are always a fall favorite. Their's just so many ways to create your own style. To be honest theirs really something for just about anyone. Even the bores like me who could always wear pink. What are your favorite fall polishes? You know whats funny.. @ the Makeup Academy I attended, one of the instructors I had is good friends with Olivia. That same instructor happened to be on Jerseylicious this season with Tracy, too! Tracy was shooting @ my Academy and teaching some hairstylists some stuff and my instructor lead the class. My Makeup Class was held downstairs from when they were shooting. It was exciting! Although Tracy isnt my favorite! OK sorry all that Jerseylish talk! -- NAIL POLISH - you and I are on the same roll with that! I have been loving nail polishes like crazy this summer.. it kind of just started for me like 3 months ago and I cant stop! I just purchased CASE STUDY (from ESSIE'S FALL COLLECTION). I have yet to use it but I cant wait to! I also picked up OPI's I EAT MAINELY LOBSTER. I literally purchased like 10 others and I should eventually put a post up of them! I also just purchased from The Container Store a Spice Rack haha to put all my nail polishes in! How do you store yours? I love those Essie Colors. Came across your thru Bloghop. Do drop by my blogs sometime. i am so in love with these colors, I'm a huge fan of fall and winter colors! I love a lot of the Fall nail colors coming out. I have Essie's Carry on and it is absolutely beautiful, a very rich color and so pigmented. As far as OPI goes I have a few of those as well. My favorites are Un Oh roll down the window and Are we there yet? I have blog posts on these as well..
oooh i love these colors. i definitely need essie glamour purse!!! I love ALL the nail polishes. I wish the Summer lasted longer, but at least there are the beautiful fall colors to make me less melancholic :-). I am loving all the grey and gun metal nail polish colors for fall. I just got OPI's French Quarter for Your Thoughts and it's great! I just purchased the Essie olive 'sew psyched' such a perfect color for fall! that middle chanel one is so fab! yet to get an essie one! enter my giveaway! @Lc hahahahah girl your so funny! I love it :) That spice rack idea is seriously freaking genius. @CottonCandy ME TOO i can't wait to wear them! @Donna I know I love that color too!! i really wanna get my hands on peridot!